We like to forge a lasting relationship with our clients, get to know them and work closely with them throughout the process. From the initial planning meeting, we will listen to your ideas and develop them to create a website we can all be proud of. There’s nothing more satisfying than being a part of something that means everything and looks terrific. Brookstone has given us a website that not only looks beautiful but works in all the ways we require! The team made the whole process so easy in a very short timeframe. It was wonderful to find a company that cared about very aspect of the website and our company. Great experience and highly recommended. Richard and the team at Brookstone Creative offer a first class website build service. They are not only excellent coders, but they speak normal language, not geek talk, so we enjoy working with them. Whether you are selling a service or a product, we can design and develop your website using the platform that best showcases what you have to offer. When the website is launched, you can be confident that it is fully optimised to give it the best possible chance to rank highly on a global stage. Pictures tell a thousand words and an online portfolio brochure website could be just what you need to portray your services to your clients. 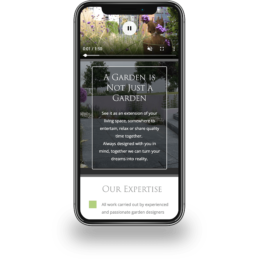 Beautifully designed headers and imagery combined with movement and functionality is what makes a great brochure website – and of course it must look great on mobiles too. Our experienced coders and developers can manipulate any “out of the box” functionality to make it unique and bespoke to your needs. Together with our graphic design abilities, we have the capability to provide the best looking websites with top drawer functionality, whatever your business. Want to boost traffic and sales?